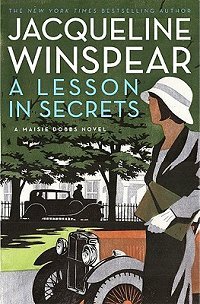 First Line: Maisie Dobbs had been aware of the motor car following her for some time. It's the summer of 1932, and Maisie Dobbs accepts an undercover assignment as a lecturer at a private college in Cambridge. It seems Scotland Yard and the Secret Service want her on campus to monitor any activities "not in the interests of the Crown." Their major focus is on controversial pacifist and college founder Greville Liddicote, but when he is found murdered, Maisie knows that she must conduct her own investigation into this as well. This eighth book in the series finds Maisie at a crossroads. She has inherited some money and wants to use it wisely to benefit those for whom she cares deeply. She also finds herself open to new experiences, so she's ripe for the picking when Scotland Yard and the Secret Service come knocking. With Maisie in Cambridge during the week and only in London on weekends, I found myself missing her assistant, Billy. Moreover, I found a subplot involving Sandra, a young woman who'd been in service to Maisie's former employers, very interesting. With Maisie spending much of her time on the road, this particular subplot wasn't fleshed out as fully as I'd hoped. The major focus of the book is twofold: Britain's sometimes less than stellar conduct during World War I, and Maisie's discovery that the Nazi Party has been making inroads in England-- as some of her fellow lecturers show up regularly to party meetings. To her surprise, Scotland Yard and the Secret Service think her reports on the Nazi Party have absolutely no significance. This emphasis on foreshadowing World War II, although promising great things in future books, made Maisie less interesting as a character. Even so, this is a strong, excellent series featuring an unconventional heroine. I look forward to Maisie's further adventures. I really want to start this series - everyone seems to love it! Cathy - Thanks for this review. I really do need to get more familiar with this series. An egregious gap in my reading! I am half way through this book and am enjoying it. This is my first Maise Dobbs book. I was a little worried about jumping into the middle of a series but it's not been a problem following the story. Now I have to go back to book one and get all the back story. Leslie-- You've got some good reading ahead of you. I'm almost jealous! I have "Messenger of Truth" which looks like maybe #4 of the series. Will be more interested in reading it now. I can NOT wait to get my hands on this one. I've read the whole series and love it so much. I know this book will be a lot different because of some of the changes from the last book (won't divulge), but I'm excited to see where the series is going. PG-- I'm excited to see where it's going as well. Thanks for stopping by!